Here's a fun album of adventures with a boy named Little Orley featuring some people you might be familiar with. First of all, there's noted bandleader Fred Waring and the Pennsylvanians, but that's not really who I mean. You'll notice that these stories are told and sung by Uncle Lumpy. He's credited on the back of the album as Lump Brannum. Still not ring a bell? Maybe you'll remember him better in the role he played later: Mr. Green Jeans on Captain Kangaroo's show. There's no date on this, but I'm thinking he did this before the CK gig. Either way, these are imaginative little stories that I think you'll enjoy. I think I've got another Little Orley album too, and I'll try to dig it up to put on the blog later. NOTE: It looks like these stories (and the stories on the other record I was going to put on here) are now available on CD! It looks like Amazon was showing them as out of print, but you can actually buy them direct at littleorley.com! You should do it too. They're fun stories you can share with your kids! We had five 78s, which I made tapes of years ago at my parents' house, and held onto. 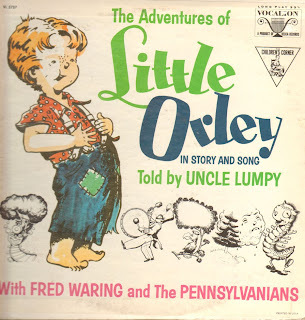 More recently, it seems a company called Uncle Goose is offering three CDs of Orley, including one of radio shows. If memory serves, they were going to finish the set with one more disk. It's great to see the album art -- we never had a cover for ours. Probably got them at Goodwill!